Patios are a widely - installed feature on most residential properties and with good reason. A patio becomes an extension of the indoor spaces and allows you to use the yard in a more optimal manner. You have the option to get the patio enclosed or leave it open to the air. Some property owners also get an outdoor kitchen installed on the patio and this enhances the functionality of the stone paver patio even further. Since a patio becomes the connecting or transitional space between the indoor and outdoor areas of your home, it tends to see a significant amount of wear and tear and this makes it important to choose good quality, hardy materials that will last for a number of years without too much trouble. It’s why we at Emerald Creek Landscapes, LLC recommend that pavers be used in patio installations. We are a well-established company in the landscaping field and have been serving customers in Ringgold, East Brainerd, and Fort Oglethorpe. Our experts have successfully completed a large number of patio design and installation projects across East Ridge, Dalton, Chattanooga and Red Bank as well. We have also catered to customers in Middle Valley, Cleveland, Soddy-Daisy, Calhoun and the surrounding areas and created beautiful patios on their properties. Since we are a full-service landscaping company, we may handle paver patio installation as part of a larger landscape project. But if you are upgrading the look of your existing patio and need brick, stone or concrete pavers installed, we can handle that job as well. All these materials are weather-resistant, are available in a range of colors, designs, styles, shapes and sizes and last for a very long time too. We understand that every homeowner will have some specific requirements and styling preferences. It’s why we go the extra mile to provide custom stone paver patio solutions. Our experts work very closely with you to understand what your specific requirements are and then provide solutions that are right in line with your needs. Variety - As mentioned earlier, stone, concrete and brick paving is available in a variety of styles, shapes and colors. This gives us the flexibility to create stunning and unique patterns on your patio. You can choose a color and pattern that complements the look of your home and landscape. Strength and Durability - Paver stones are extremely resilient and durable and are able to weather the elements. This makes them ideal for outdoor applications such as patio installation. Low Maintenance - We also focus on ensuring that any feature we design and install be low-maintenance. Pavers are very easy to maintain and only require an occasional pressure-clean. You also have the option to get the surfaces seal-coated every two years; this adds to the resilience of the pavers. 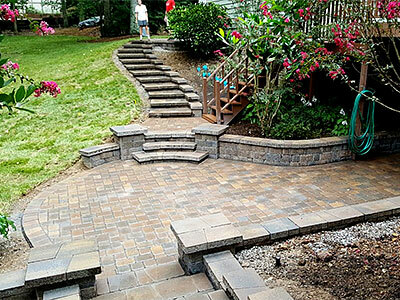 With the vast experience and expertise we have developed over the years, we know what it takes to provide excellent solutions at very competitive paver installation cost. For any more information on our services or to discuss your project details, feel free to call Emerald Creek Landscapes, LLC at 423-593-5443. You can also send us your queries and project details via this online form.